“I recently installed your product on a patio. It looks great but if you press on it with your finger, it feels soft.” This is a real question we received from a contractor … and we get questions like it a lot. So in this blog post, we’ll address the factors that may contribute to why your polymeric sand did not harden. Polymeric sand cures by drying. And in order to fully set, it needs to dry out completely. If your polymeric sand didn’t harden up, it’s pretty much guaranteed there’s a moisture issue. If the joints remain wet after the installation, they will remain soft until they dry. So getting one initial complete drying "set" is very important to the long-term performance and lifespan of the product. Note, this is why we always recommend checking the weather before starting a polymeric sand project. 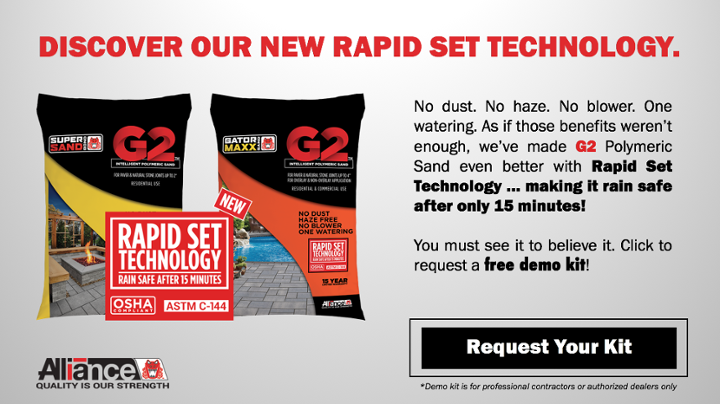 (Alliance Gator polymeric sands are considered rainproof in one hour at temperatures over 32° F degrees.) In our blog post, “My polymeric sand job got rained on. What do I do?” we explore this topic a bit more. Also, if the base material is not pitched properly, moisture issues can occur. The crushed stone base should be pitched the same as the paver surface. It’s never a good idea to leave depressions in the crushed stone base, assuming that you will later make up for it with the sand setting bed. These depressions all become puddles. When water wicks up through the joints, it will keep them wet in a seemingly mind boggling pattern to someone observing the situation from the top. To conclude, there are several factors that can prevent polymeric sand from setting up properly. If the joints don’t dry out in the first couple weeks or so, the odds are that the sand has been compromised … even if it does eventually dry out. Want to avoid having to redo the entire job? Read this blog post before getting started: Top 5 Reasons For Polymeric Sand Epic Fails.